The senior pastor in a Mobile, Alabama, church cut up articles of Nike clothing during a sermon in an apparent protest of former NFL player Colin Kaepernick's controversial ad campaign for the brand. He was greeted by cheers, laughs and eventually, what appeared to be, a standing ovation from his congregation. 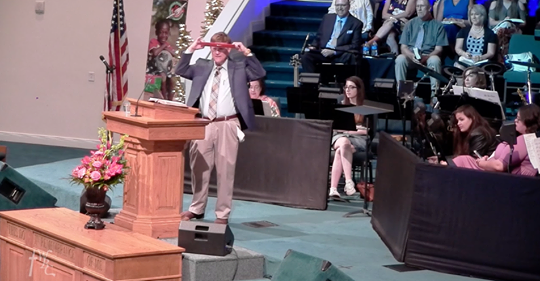 Pastor Dr. Mack Morris is seen presenting a sermon titled "The Storms of Life," in a video posted by a Vimeo account claiming to be the Woodridge Baptist Church Sunday. The video's graphics indicate that Morris is the pastor speaking. "The first pair of jogging shoes I wore were Nike jogging shoes. That was in the early 80's. I've been wearing Nike jogging shoes since 1980," says Morris, "I got news for you, I've bought my last pair of Nike shoes." After the pastor states he will no longer be wearing Nike jogging shoes, he pulls a white Nike "wristband(s)" and red "headband(s)" out of his pocket. He then cuts both accessories up with scissors before tossing the fabric on the ground and telling the congregation, "I ain't using that no more." Applause and cheering can be heard from behind the camera. Morris then continues his sermon stating, "Colin Kaepernick. He's just inked a contract with Nike. Nobody knows and nobody's telling how many multi-million dollars that is going to be simply because he does not want to stand when the national anthem is sung." Kaepernick famously began kneeling in 2016 during the national anthem to protest racial injustice and police brutality, which brought a wave of protests from other players across the sport. Some criticize the protests as an act of disrespect to the flag and the nation's veterans. Nike announced Kaepernick was going to be one of the faces of its 30th anniversary "Just Do It" campaign last week and controversy ensued. Many lauded the ad, while many others, including President Trump have been critical of the brand's decision. Pastor Morris is the latest person to criticize the brand, as well as Kaepernick. The pastor finished up the portion of his sermon by stating, "America may not be the best country in the world and we've got a lot of faults, but I'm telling you what, a lot of folks died for the sake of what that flag represents."